Bitcoin has just celebrated its 10th birthday on October 31. Anniversary set aside, it seems that there is no stopping to the cryptocurrency movement. While more and more people own some cryptocurrencies, businesses also start to adopt this innovative payment method. Time is proving that convenience, speed, security and cost are the major reasons why shoppers are choosing cryptocurrencies instead of traditional payment methods. With evolution of the blockchain and its growing adoption, more well-developed, user-friendly payment platforms have appeared. For merchants, such cryptocurrency gateways remove the blockchain technology barrier. This way, accepting crypto payments for any online store becomes as simple as an integration of a module from the PrestaShop back-office. ‘Why should I bother to accept cryptocurrency payments?’, you may ask. There are quite a few reasons, in fact. Tiny fees, zero risk of chargebacks, access to a global customer base, and the possibility to get paid straight to your bank account, are just a few perks that any merchant can benefit from. With all the exciting developments happening every day, cryptocurrency is growing to be among the most exciting industries of this century. It is still a very young industry, however, and it is important to stay updated and aware of the latest trends going on. For business-minded people, understanding the potential of cryptocurrency is crucial - whether using it for payments, or building a blockchain-oriented company, there is a lot of room to build and maintain a competitive edge by becoming an early adopter. Explaining blockchain can be tricky, but the technology in itself is not that complicated. Essentially, blockchain is a public database (ledger) which has several unique features compared to other databases. The main unique trait is “decentralization” - the information of the ledger is shared and stored across thousands of computers across the world, meaning that no single authority controls the blockchain. Now, because blockchain is decentralized, all the perks related to Bitcoin and cryptocurrency payments are made possible. Decentralization would not be possible without “miners”, whose job is to process transactions by solving complex algorithms and permanently store them in “blocks” on the block-chain. Miners compete in an intricate ecosystem with its own internal economy, all playing under the same rules and receiving rewards for their computing power. This way, everyone on the Bitcoin network can be sure that all transactions on the blockchain are 100% legitimate, meaning that it is improbable to scam someone with a fake transaction or hack the whole system. On top of that, when using cryptocurrencies like Bitcoin, Litecoin, or Ethereum, the involvement of financial institutions, such as banks, becomes unnecessary. This means that no one can control or block transactions, and no one can impose fees for the purpose of profit. The benefits apply to both businesses and shoppers, resulting in cheaper, faster, safer, and unrestricted payments globally. Blockchain technology is driving adoption of cryptocurrencies, and a lot of this relates to how convenient it has become to make payments through crypto. While traditional payment methods are troubled by many issues, Bitcoin was designed in a way to eliminate them, and make payments possible on a global scale, efficiently. For example, try making a bank transfer on Saturday night from France to Japan. The transfer will take quite a while, and most likely cost you a fortune. The risk of currency conversion is yet another issue. Bitcoin solves all of these problems, by design, because payments are not limited to any particular day or time, a location, or an institution. In addition, new technologies built on top of the blockchain, such as Lightning Network, enable cross-border transactions in a fraction of a second, at a cost of less than one cent. In fact, you could easily - and instantly - send Bitcoin from Moon to Earth (if you have an Internet connection, of course). From small online shops to huge companies like Microsoft, Overstock, Etsy and Subway, thousands of businesses worldwide successfully utilize blockchain for payments. More than 200,000 PrestaShop store owners are a few clicks away from joining the early adopters and reaping all the benefits of the global cryptocurrency market. The potential rewards are vast, and they are real. Blockchain has no geographical restrictions - cryptocurrency is easy to send and receive on a global scale. Location doesn’t affect the cost or speed of transactions at all. Whether you sell products in your local market, ship them across the ocean, or only deal with digital goods, you can take advantage of cryptocurrencies. Cryptocurrency transactions are irreversible, meaning that the merchant is 100% secure to ship the goods or deliver the services once a payment is received. This is especially relevant for digital goods merchants and higher risk industries, which regularly face fraudulent chargebacks. Merchants often struggle to find a suitable payment provider, even though there are thousands out there. Credit card payments can easily cost 3% for every transaction, and often even more. In comparison, payments via blockchain are cheap, and crypto payment gateways offer much better rates, without any setup and on-boarding costs. In addition, recent developments of the Lightning Network might reduce transaction costs even more drastically. Cryptocurrency is at the early adoption stage, which is why you can be among the first to use this innovative payment method. Sometimes, just a few posts on your social media channels and a Bitcoin logo on your website can suffice as powerful marketing tools. The value is two-fold: not only you can quickly boost your sales, but also show off as a forward-thinking company to gain a competitive advantage. Crypto shoppers are proven to spend more than typical customers. Businesses across the world recognize that by accepting cryptocurrencies and promoting themselves as crypto-friendly establishments. Therefore, promoting this new payment option can help catch the attention of cryptocurrency enthusiasts and attract them to your store. Some will most definitely return and maybe even stay loyal! How do you start accepting cryptocurrencies? 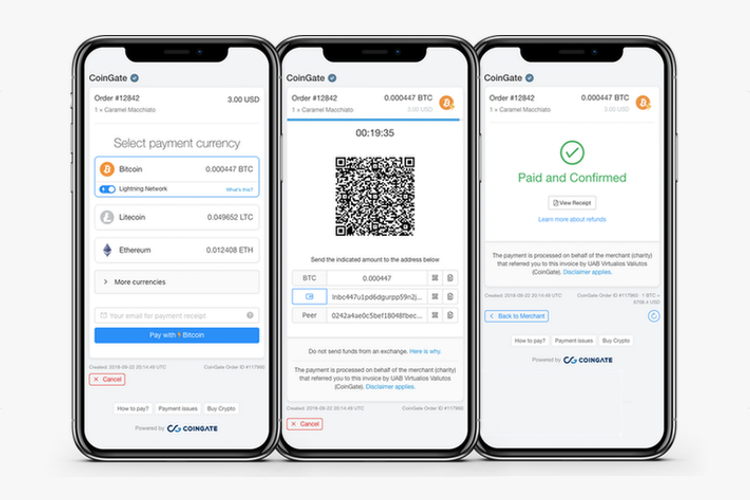 Cryptocurrency payment gateway CoinGate, an official PrestaShop partner, offers an easy payment solution for merchants that wish to accept various cryptocurrencies in their stores. The module, when integrated into the website, allows customers to make payments in the most popular cryptocurrencies, including Bitcoin, Litecoin, Ethereum and many more. CoinGate can then convert the collected payments to Euros and transfer them directly to the merchant’s bank account. As such, merchants are not forced to actually deal with cryptocurrency at all, if they do not wish to do so, while still getting the same benefits. How difficult it is to integrate the CoinGate module? Integration of the CoinGate module is simple and does not require programming knowledge. Find and install it through the PrestaShop marketplace or your store’s back-office! Once the module is installed, the last step is to create an account with CoinGate (remember to get verified to receive Euros to your bank). From there, you are pretty much all set up. What if the price of the cryptocurrency goes down? There is no risk of volatility as CoinGate locks the price at the moment of purchase. Therefore, the merchant always gets the exact value of purchase made at a specific time. I do not want to store Bitcoin, what should I do with it? CoinGate customers can withdraw all funds in Euros, directly to their bank account. If I accept cryptocurrency, how do I pay taxes? You should treat payments with cryptocurrency as any other payment method. As long as you receive euros in his bank account, taxes apply as usual. CoinGate charges a 1% fee for payments processed. No setup costs or monthly fees. Compared to any credit card gateway, crypto payments are much more cost efficient. Are you ready to jump on the crypto train? Thousands of merchants are already reaping the benefits! Learn more at www.coingate.com.